1) Cocoa powder coating on chocolate truffles (as described in Martha Stewart Living magazine) is really bitter. Will try either granulated sugar or chopped nuts next time. 2) Three-quarters of a teaspoon of raspberry extract is not enough to make a batch of about four dozen truffles taste like raspberry. Will try either more extract or flavored liqueur instead next time. I am determined to have homemade favors at my wedding. And since I am of the opinion that edible wedding favors are best, today I made my first batch of chocolate truffles. They are still chilling in the fridge so I don't know how they taste yet. Dan and I will try them later. I combined three recipies to make them, but they are pretty simple. Maybe simple enough to make the 300+ we'll need for our wedding. Yikes! P.S. My laptop power cable has been found and it will be shipped to me next week. At the gym today a couple of guys were chatting by the water cooler. It sounded like they were friends who hadn't seen each other for awhile and wanted to catch up. After about five minutes one of the guys said, "Well, these weights aren't gonna lift themselves." I almost laughed out loud. I was in such a rush to leave my hotel in Baltimore this morning that I left my laptop power cable plugged into the wall. At least I remembered the laptop (and everything else). I just barely made my 6:50 AM flight even after running to the front of the check-in and security lines because I was late. I'm glad to be home now. To make up for our failure at the aquarium, Dan and I planned to replicate the pictures we took of each other on a dock in the Long Beach Marina five years ago. But when we got there we discovered that the dock had been set up for a wedding reception. For years that dock was quiet and peaceful, but not several restaurants have been built nearby and it looks like food is served regularly out on the dock. It's a shame. Once again we didn't get to take the pictures we had prepared for. At least we got to have dinner at the Yardhouse, which is one of your favorite restaurants. Then we wandered around the marina to kill some time before going to see Dan's friend's Irish pub band perform at the Auld Dubliner. The sign outside said that the live music would start at 9 PM so we went to Borders to read magazines to pass the time. While Dan read about cars and Adobe Photoshop, I scoured the pages of four bridal magazines for pictures of wedding cakes. Our cake is part of the reception package at the hotel so we just have to decide on the flavor and design. The magazines I looked at provided absolutely no inspiration. At 8:45 PM we walked over to the pub only to find out the music actually wasn't scheduled to begin until 10 PM. By then we were tired and just decided to drive home. So, to summarize our trip to Long Beach, we were thwarted on all counts. Last Saturday Dan and I decided to spend the afternoon and evening at the Aquarium of the Pacific and the Long Beach Marina. 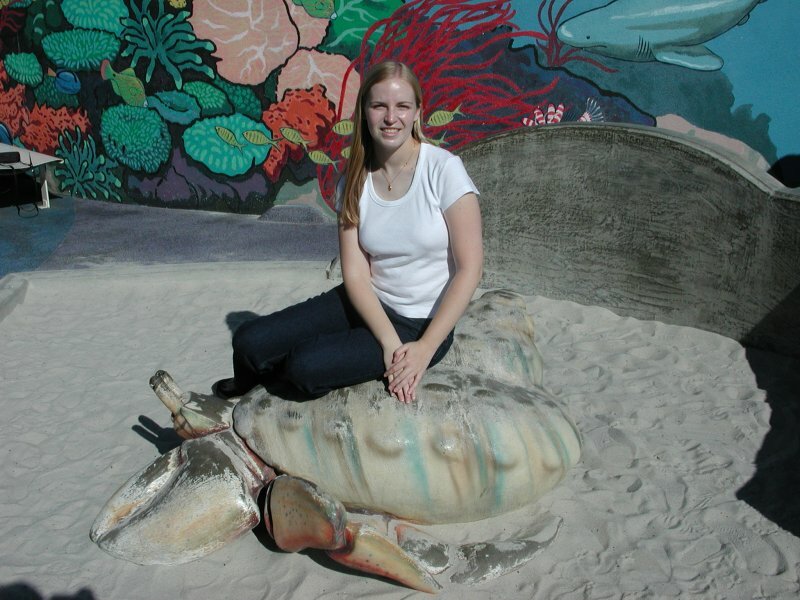 One of our first dates (late June/early July 2001) was at the aquarium and that's where the first picture of the two of us was taken. 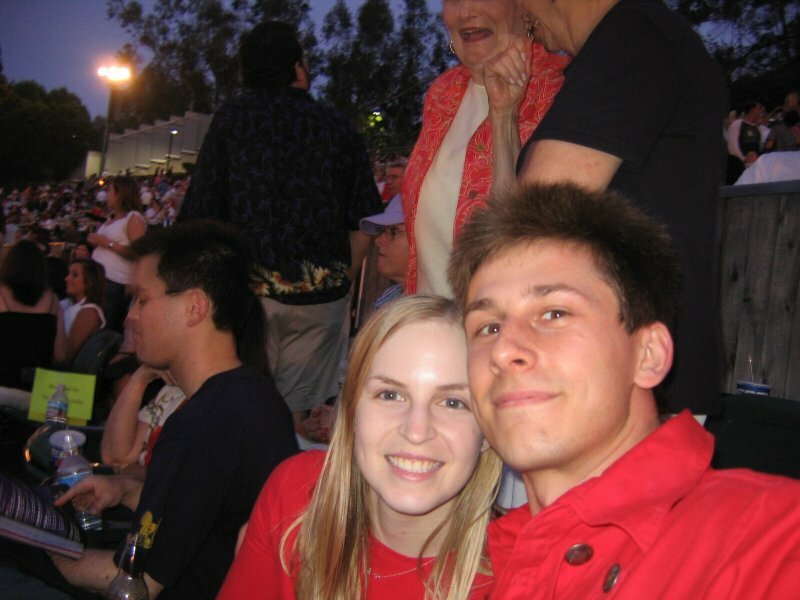 (See the "Long Beach Marina 2001" section of my online photo album for those pictures.) While neither of us still own the clothes we were wearing in those photos, we did our best to find similar outfits to try and replicate the pictures five years later. 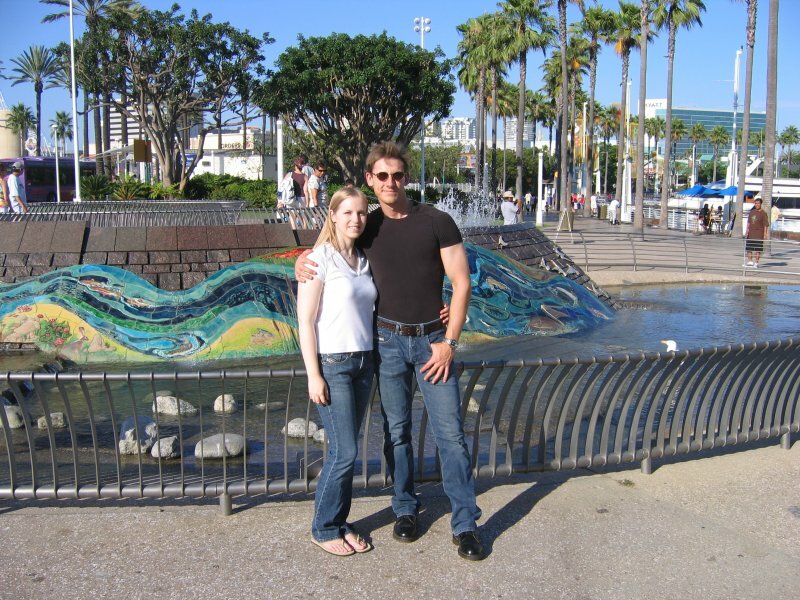 The picture of us at the Aquarium of the Pacific was taken in front of a gorgeous mural with fish and other ocean life that made a great backdrop. After searching (and asking an employee) we found the wall where the mural previously was and discovered that it had been painted over. The colorful mural where Dan and I posed for our first picture together is now covered with drab brown paint. You could see a few places where the ugly paint had chipped off, revealing the bright blue of the water underneath. Terrible. However, we were able to replicate one other picture from the aquarium, as you can see in the above images. 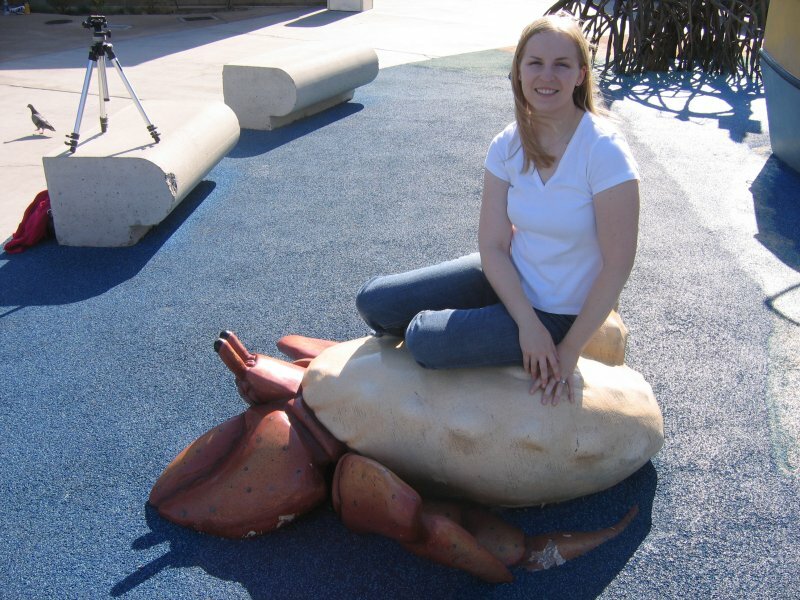 The giant crab has been painted and moved out of the sandbox in the past five years, but it is unmistakably the same crab. On Saturday, July 8th my mom and I had some time to kill while an electrician was installing a 220 V line for Dan's woodworking equipment. On a whim I called another bridal boutique and made an appointment. At first we were skeptical of House of Brides in Torrance. It was in a strip mall and the dresses in the window were horribly out of date. After our experience on Thursday we weren't expecting much, but I looked through the racks of gowns anyway to see if there were any I wanted to try on. I picked out about six and my mom and I both liked a couple of them, but we still hadn't found "the one" yet. I was hoping for that moment where my mom starts to cry and I know that this is absolutely THE dress for me. The last item in the fitting room was a gown that the lady who worked there picked out. She had received it just the day before and no one had tried it on yet. Upon inspection it wasn't what I was looking for, but when I tried on the dress everything changed. My mom got teary-eyed and so did I. Suddenly I knew I had found my wedding gown. I know the National Hurricane Center recycles storm names every so often, but I'm wondering if they suffer from a lack of creativity. Case in point, the newly formed Tropical Storm Beryl. I can't be the only one who remembers the previous Tropical Storm Beryl, can I? It was just six years ago! Today I bought a wedding dress. 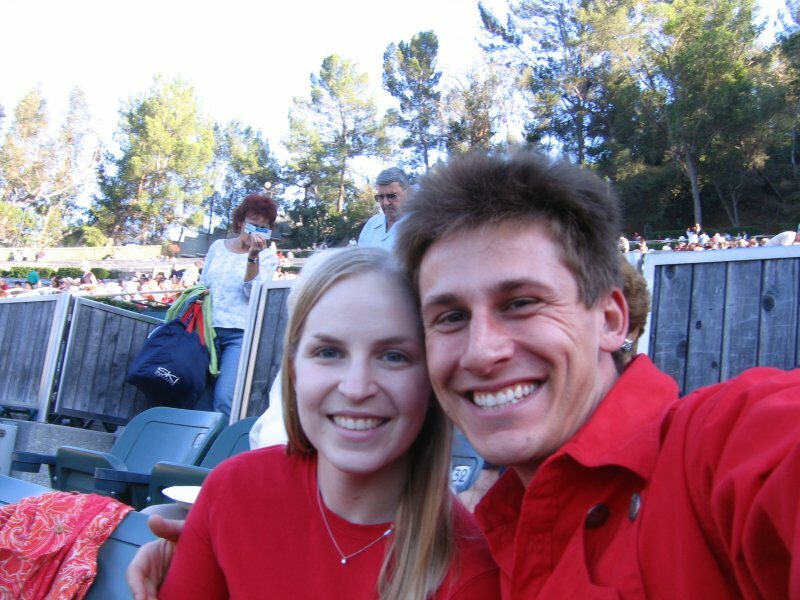 Yesterday Dan and I went to the Hollywood Bowl for their annual "Fourth of July Fireworks Spectacular" which is our favorite way to celebrate July 4th. We packed a huge picnic, took lots of pictures, and had a great time. The guest performer this year was Kenny Loggins, but the only song of his that I recognized was "Footloose" (which he performed as an encore). It was still lots of fun. P.S. I realize that I haven't posted much here lately, but my mom and I are going wedding dress shopping tomorrow so I should have something to write about after that!